MetroBeat is a metronome that can play the sound of the drum. You can choose speed from 50-200. And you can choose rhythm from 4 beat or 8 beat or 12 beat or 16 beat. MetroBeat can play the rhythm of the drum sounds, for example, it is convenient to use when practicing a musical instrument, etc. 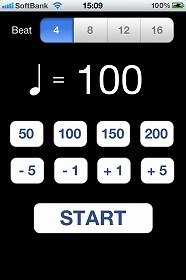 【50】,【100】,【150】,【200】… Set the playback speed of each number. 【-5】,【-1】,【+1】,【+5】… Increase or decrease the playback speed of each number.